Dmitry Yurasov Captures Event #42: $10,000 No-Limit Hold'em 6-Handed Championship for $775,923! 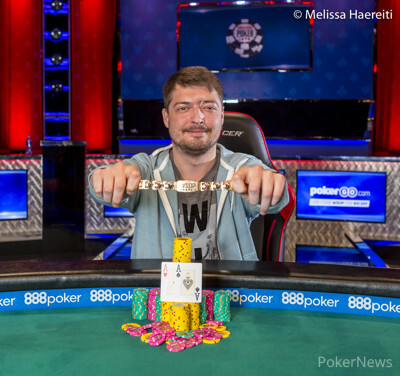 The stacked Event #42: $10,000 No-Limit Hold'em 6-Handed Championship is over, and Dmitry Yurasov has captured his first World Series of Poker gold bracelet in dramatic fashion. He defeated Tommy Chen in just nine hands from the time heads-up play began, and steamrolled the final table in just 58 hands. This event attracted the cream of the crop with a total of 332 entries paying out 50 spots for a total prize pool worth $3,120,000. Yurasov claimed a first-place prize worth $775,923 along with a coveted gold bracelet. In the final hand, Yurasov already had a commanding lead over Chen, and they saw a queen-high board by the turn. Chen moved all in over top of Yurasov's lead-out and got called quickly. Yurasov tabled two aces and Chen revealed top pair. The river was a brick and it was only fitting that Yurasov claimed the title with the best hand in poker after he dominated here on Day 3. Yurasov, a professional poker player from Russia, has amassed just over $2 million in earnings after clinching this win. Before taking down this event, his best live cash came from the Prague EPT €10,300 No Limit Hold'em High Roller for $243,237 USD, finishing in third place. In addition to this, he has a total of five EPT High Roller final tables, and one EPT Main Event final table where he finished in third place. The newly-crowned champion explained that he has been playing higher buy-in tournaments for a while but "winning this bracelet is a special achievement" for him. When asked about running so hot at the final table he said it felt like an "easy game". Yurasov plans on playing more tournaments in the United States, maybe even in Los Angeles, for example. He continued that his online background helps because he "always gets to keep himself in shape playing shorter games online." Considering the field was stacked, it's no surprise that there were a ton of notable players that made it deep in the money, including Dario Sammartino (8th place - $69,578), Connor Drinan (9th place - $51,494), Eric Wasserson (11th place - $39,284), Charlie Carrel (15th place - $30,922), Dan Smith (29th place - $21,131), Olivier Busquet (32nd place - $18,386), Sam Grafton (35th place - $18,386), Sam Trickett (37th place - $16,580), Timothy Adams (38th place - $16,580), Ben Yu (40th place - $16,580), Rainer Kempe (44th place - $15,516), and Jonathan Jaffe (47th place - $15,516). Some of the incredible players in this field who were unable to get anything going, falling short of the money, included Phil Hellmuth, Michael Mizrachi, Cliff Josephy, Greg Merson, Mohsin Charania, Davidi Kitai, Jonathan Duhamel, Niall Farrell, JC Tran, Brian Rast, Jason Mercier, and Doug Polk. The official final table of six came together after the elimination of short-stacked Grayson Ramage (7th place - $69,578). He got it in with king-queen off suit but ran into Yurasov's ace-king and that was the end of the road for him. Two-time WSOP bracelet winner Kristen Bicknell was short and managed to find a double up once six-handed play began, but she lost a big pot to Yurasov just before dinner and was left with just five big blinds. Shortly after dinner, Bicknell called off her stack with king-three suited and was up against Chen's ace-eight off-suit. Chen flopped an ace and Bicknell couldn't catch up, settling for a payday worth $96,823 for her sixth-place finish. As soon as Bicknell hit the rail, chips really started to fly. In the very next hand, Albert Daher ran into a cooler against Yurasov, where he turned a flush and that very same card gave Yurasov a boat. They got their chips in the middle and Daher had to settle for fifth place, pocketing $138,644 for his deep run. Just eight short hands later, Artem Metalidi committed his remaining chips with a pair of sevens, finding himself flipping with the red-hot Yurasov's ace-queen off suit. He couldn't dodge a queen on the flop and pocketed $204,128 for fourth place. Three-handed play lasted 12 hands, after which time Jacob Powers got his chips in good with ace-king, dominating Yurasov's ace-nine. He was standing on his feet and pumped up for a double up, but unfortunately for him, he couldn't fade a nine on the flop. 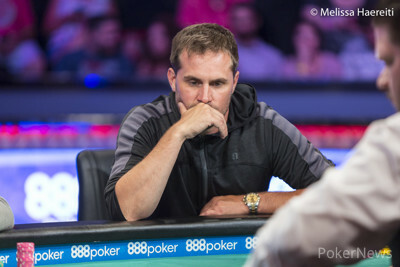 Powers was visibly crushed, but has to be happy with his third place finish worth $308,783. As mentioned, heads-up play didn't last long and Yurasov's heater topped off with him winning with two aces to clinch his first bracelet. Impressively, Yurasov eliminated all of the players on the final table, with the exception of Bicknell who fell to Chen. Hand #58: Tommy Chen called on the button and Dmitry Yurasov raised to 400,000. Chen called and they saw a flop of . Yurasov bet out 475,000 and Chen called. The turn was the . Yurasov bet 1,150,000 and Chen moved all in for 2,750,000. Yurasov called and Chen was at risk and behind. The players were on their feet waiting for the river card. It was the and Chen's day was done. Chen is the 2nd place finisher, taking home a payday of $479,561. Hand #55: Dmitry Yurasov called and Tommy Chen checked. The flop came and both players checked to the on the turn. Chen checked, Yurasov bet 100,000 and Chen called. The river was the . Chen checked, Yurasov bet 250,000 and Chen called. Yurasov tabled for ace-high and Chen showed for two pair to rake in the pot. Hand #56: Chen raised to 165,000 and Yurasov called. The flop came . Yurasov checked and Chen bet 150,000. Yurasov called. The turn was the and Yurasov checked again. Chen bet 420,000 this time and Yurasov called again. The river was the and both players checked. Yurasov tabled for king high and Chen tabled the winner with for two pair. Hand #57: Yurasov raised to 200,000 and Chen called. The flop came and Chen checked. Yurasov bet 225,000 and Chen called. The turn was the and Chen checked for a second time. Yurasov reached into his stack and bet 550,000 this time. Chen folded. Hand #49: Tommy Chen raised to 200,000 on the button and Dmitry Yurasov called in the big blind. The flop was and Yurasov checked. Chen bet 175,000 and Yurasov called. The turn brought the and Yurasov checked again. Chen checked back and the river was the . Yurasov checked one more time and Chen bet 420,000. Yurasov folded and the pot went to Chen. Hand #51: Yurasov folded his button and Chen wins the blinds and antes. Hand #52: Chen raised to 200,000 on the button and Yurasov folded. Hand #53: Yurasov raised to 200,000 on the button and Chen called in the big blind. The flop was and Chen checked. Yurasov bet 125,000 and Chen folded. Hand #54: Chen raised to 200,000 on the button and Yurasov folded. The final two players have taken their seats. 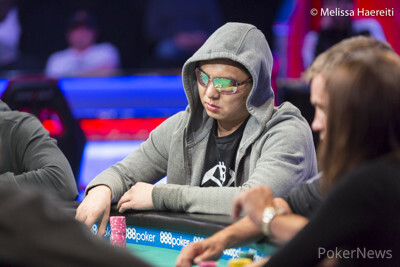 Dmitry Yurasov sits on 14,100,000 while Tommy Chen has a bit of an uphill battle, sitting on 2,475,000. Hand #48: Dmitry Yurasov raised to 160,000 on the button and Jacob Powers moved all in from the big blind. Yurasov called. Powers was at risk with but he was well ahead of Yurasov's . The flop came and Yurasov's hot streak continued as he out-flopped Powers to take the lead. The turn was the and the river was the , sending Powers to the rail in third place. Hand #42: Yurasov raised to 180,000 from the button and Tommy Chen moved all in from the small blind. Yurasov looked at Chen and his stack for a little while and folded. Hand #43: Jacob Powers completed in the small blind and Yurasov raised to 250,000 in the big blind. Powers called. They both checked the flop and the turn. The river was the . Powers checked, Yurasov bet 300,000, and Powers called. Yurasov tabled , good for the pot. Hand #44: Jacob Powers raised to 300,000 on the button and the blinds folded. Hand #45: Tommy Chen raised to 225,000 in the small blind and Powers went all in from the big blind. Chen called for the rest of his stack which totaled 1,410,000. The board came and Chen doubled up with trip queens. Hand #46: Chen raised to 225,000 on the button and Dmitry Yurasov called in the big blind. The flop was and they both checked. On the turn, Yurasov reached for chips and Chen folded. Hand #47: Jacob Powers limped in on the button, Dmitry Yurasov called from the small blind and Tommy Chen checked his option in the big blind. The flop came and all three players checked to the on the turn. The river was the and it was checked to Powers, who bet 100,000. He got no action and scooped the pot. Hand #37: Jacob Powers called from the small blind and Dmitry Yurasov checked his option from the big blind. The flop came and both players checked to the on the turn. Powers bet 80,000 and Yurasov folded. Hand #38: Yurasov called from the small blind and Tommy Chen moved all in from the big blind. Yurasov mucked. Hand #39: Yurasov raised to 180,000 on the button and Powers called from the big blind. Powers checked dark, and the flop came . Yurasov bet 125,000 and Powers called. Powers checked dark again and the turn was the . Yurasov bet 300,000 this time and Powers snap-mucked. Hand #40: Powers called from the small blind and Yurasov raised to 275,000 from the big blind. Powers called. The flop came and Powers checked. Yurasov bet 300,000 and Powers called. Powers checked dark and the turn was the . Yurasov reached into his stack and bet 775,000. Powers folded. Hand #41: Powers raised to 225,000 on the button and scooped the blinds and antes.